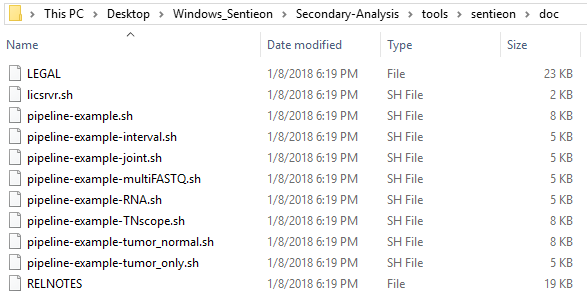 The first part of the Getting Started Guide for Sentieon described the steps for downloading the Sentieon tools, acquiring a license file, and running the example script/pipeline to generate the VCF and BAM files. This blog will cover some custom script changes users can make to add more efficiency when running through multiple samples at once. We will explore some additional example scripts that come downloaded with Sentieon (Fig 1). In a subdirectory within the Secondary Analysis directory, you’ll find the doc directory which contains a list of example scripts users can reference when building their own. Fig 1. List of example scripts users can use to customize their own secondary pipelines. One particularly helpful script is the pipeline-example-joint.sh. This is especially useful in the context of trio data, for example. A major consideration for the application of trio data is in the search for de novo variants; you want to jointly call the parents to determine if the de novo variant for the proband is truly called reference for the parents. Doing joint calling on multiple samples at one time can be done in a couple of ways. The manual illustrates these options in section 9.3.2 (Fig 2 & 3). 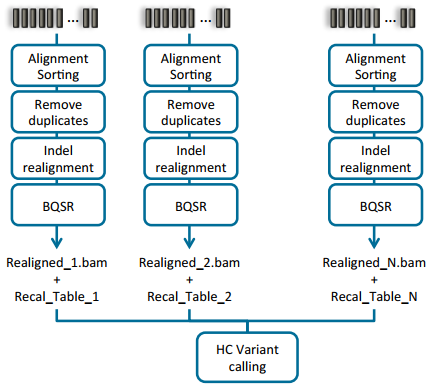 Option one is to process each sample individually to produce the BAM file for each, then process all samples collectively using the variant caller (Fig 2). The second approach is to process each sample individually through the variant calling step, then ultimately create a comprehensive GVCF file. 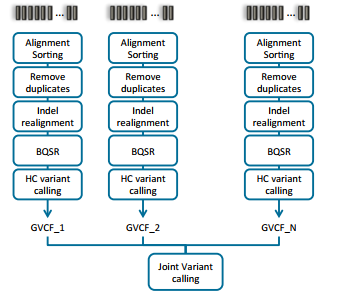 The main difference between a VCF and GVCF is that the VCF is only a list of variants and genotypes for a sample, while the GVCF will have blocks summarizing the reference regions and their respective read depths. This is then used to “fill in” a reference genotype when merging multiple GVCF files into one joint called file. Note that VarSeq also supports importing GVCF files directly and similarly fills in using the data provided for ref-regions in each GVCF file. Fig 2. Joint calling option 1 – variant calls with multiple bam files. Fig 3. Joint calling option 2 – joint variant calling for all samples gvcf. You can get a sense of how to designate your samples from the joint calling script (Fig 4). You are going to define the path to fastq folder which in this example is /home/pipeline/samples. You are also going to assign the fastq_1 and fastq_2 for each sample (i.e. the forward and reverse for each sample). Then under the alignment section of the script (Fig 5 a&b), you will see the script is written to capture the forward and reverse reads for any samples with the 1.fastq.gz and 2.fastq.gz suffix. The user may find it easier to either modify their script with their custom file paths and file names or change their sample names to match the script. Fig 4. Sample designation in the pipeline-example-joint.sh script. Fig 5b. Section of the script that grabs the samples out of the fastq_folder with samples containing the fastq_1 and fastq_2 suffix. 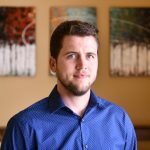 Remember, this blog is a follow up to our first Sentieon startup blog. Part 1 will give you instruction on how to run the Sentieon scripts once you have designated your samples and customized your script. Also, please feel free to reach out to Golden Helix if you would like to start a trial of Sentieon or learn more about the improved performance and accuracy in variant calling.